Using this step you can schedule an automated periodical backup based on settings you defined during backup process setup. Figure 14. When to back up. To schedule automated backup choose to make backup Later. Enter Task name, set Start date and time and Schedule task frequency. Note: The program will backup only the data you chose during backup process setup. If you created new mail accounts or added new data files in Outlook you would have to re-create the backup task to backup new data too. Warning! You have to be logged on to Windows to let the Windows Task Scheduler run the backup task. If you want to run a task without logging on to Windows you have to setup an additional settings for the backup task. Go to Start > Settings > Control Panel and open Scheduled Tasks. 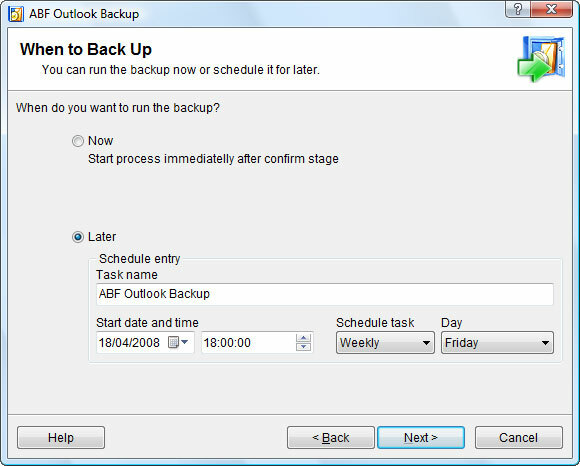 Find the task you’ve created with ABF Outlook Backup and open it. In Task tab uncheck Run only if logged on check-box and click Apply button. Look which user is stated in Run as field, hit Set Password button, enter the user’s password and click OK.